A player has “addressed the ball” when he has taken his stance and has also grounded his club, except that in a hazard a player has addressed the ball when he has taken his stance. You will see that there are two main differences; the removal of stance as a requirement and the introduction of the word “immediately”. With the benefit of hindsight, the removal of the stance prerequisite now seems an obvious simplification to the Rules in that most players do not ground their club for a stroke until they have completed their stance. Note that when a player’s ball lies in a hazard they are now not going to address their ball at all in the vast majority of cases, as stance is no longer a requirement and you may not ground your club in a hazard (bunker or water hazard). I say the vast majority of cases because you are permitted to ground your club on an immovable obstruction situated in a hazard (e.g. a bridge in a water hazard, Decision 13-4/30), and you are permitted to ground your club outside of a hazard if your ball lies just inside the margin of the hazard. It is less obvious why the second change to the definition has been introduced and it has already created much discussion and disagreement between Rules experts. 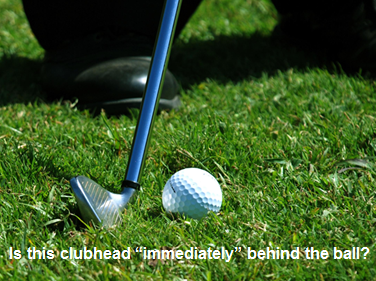 How far is “immediately” in the phrase “has grounded his club immediately in front of or immediately behind the ball”? Does two inches (5 centimeters) qualify, or does it mean “any closer and it would be touching the ball”, as has been suggested by authoritative sources connected with the USGA? In my opinion, the player in the photo above has not grounded their club “immediately” behind their ball and so they have not addressed their ball. This is bound to cause a lot of arguments and I am very surprised that the Ruling Bodies did not clarify the introduction of the word “immediately” with a relevant Decision. A related change to the new Definition of Address is the revised Rule 18-2b, Ball Moving after Address; Note that this paragraph will no longer be relevant after the Rules of Golf revisions dated 1st January 2012 become effective. If a player’s ball in play moves after he has addressed it (other than as a result of a stroke), the player is deemed to have moved the ball and incurs a penalty of one stroke. The ball must be replaced, unless the movement of the ball occurs after the player has begun the stroke or the backward movement of the club for the stroke and the stroke is made. A principle behind this Rule was that it was more than coincidence if a ball moved after the player had taken the action of addressing it. They were penalised on the assumption that either the placing of their feet or the grounding of their club was the cause of the ball moving, without any external factors being taken into account. There have been several high-profile incidents over the past four years where it was blatantly obvious that it was wind that caused a ball to move and not the player. This inequity has now been resolved. However, note that the amendment to the Rule is not a ‘get out of jail free’ card; it must be known or virtually certain that the player did not cause their ball to move. In my opinion both of these amendments have helped to simplify and remove inconsistencies from the Rules of Golf. Now that I have over three years of blogs archived, the search feature at the top right of the home page can be really useful. Just enter your query in the ‘Search This Blog’ box. So then, Kevin Na taking a practice swing after he has taken his stance and waggled several (many) times is okay? I am not sure that I understand what you are asking here. Taking a stance is not now a requirement of addressing the ball and waggling a club several times never has been. If Na grounds his club immediately behind the ball, other than on the teeing ground, Rule 18-2b applies, even if he then aborts his swing during his forward momentum and starts his procedure again. My issue with "immediate" is from another direction: When putting, while taking my stance and addressing the ball, I will place the putter from 4 inches to a foot in front of ball. I have had a number of discussions with other players and pros as to the legality of this. Prior the 2012 rule change it was legal, but now how far in front of the ball can I legally place my putter when addressing the ball. Your routine of placing your putter head in front of the ball before putting is permitted by the Rules, providing you do not press down on your line of putt. In my opinion, placing your club 3-4" in front of your ball does not constitute "immediately" in front and therefore you have not grounded your club at that point. Anything less than 3-4" and I would consider it grounded. Dustin Johnson grounded his putter during practice stroke. Is that grounding the club ? No question that the USGA handled the DJ 5th hole penalty poorly. Not much if any disagreement on that. Was their decision right or wrong? They had plenty of time to get it right. They decided that more than likely Dustin caused the ball to move. Since Justin had not soled his club, I'm assuming it was the "suction" generated from the putter face when he was placing his putter behind the ball that caused it to move backwards. Of course there is no possibility that the 14 stimp reading combined with spike marks, ball marks and wind had nothing to do with the ball moving. It's good to know that the recent rule re-write has taken care of the issue once and for all! Now the USGA needs to get serious about ball marking and penalize accidental ball or marker movement. I would think immediate disqualification requiring the player to immediately leave the course, avoiding any confusion by competitors or viewers.. I hope to be writing more on this incident later today, including the statement from the USGA, which corrects many of the misunderstandings that surround the issue, largely generated by commentators with little understanding of the Rules. In my opinion, the weight of evidence does lean towards Dustin causing his ball to move when he grounded his club close to his ball and brushed the grass while making a practice stroke. I've read the USGA's statement which, for me, only adds fodder to the issue when they say "almost immediately". I believe that the "weight of evidence" leans toward Dustin not likely to have caused the ball to move. So we disagree and that's fine. Paul and Brad know the rule. It's unambiguous. Furthermore, I believe that the reviewing process that took place after the 5th hole was influenced by the USGA trying to appear diligent or not look bad. After all everyone, saw Lowry call the penalty on himself during Saturday's round. From "trying to not look bad" the mishandling of the situation escalated into a total debacle, leaving the USGA with no choice but to assess the penalty. Had they not assessed the penalty, they would have been branded for evermore. The USGA painted themselves into a corner wherein they had no choice but to assess the penalty. I have set out my thoughts on this matter, which differ considerably from yours, in the blog that I have posted today, 21st June 2016. Yes. Please see my blog on the DJ incident posted today, 21st June 2016. I have a practice of getting set up over a putt with the club grounded about four inches behind the ball; then I'll take back and forth strokes to get the putter aligned and practice speed of the coming stroke - all without touching the ball. Then, I'll take the stroke and actually hit the ball. Kind of like a putter waggle. Am I legal? Yes, there is nothing in your pre-putt routine that is against the Rules and, as of yesterday (1st January), there is no penalty if you accidentally move your ball during the routine, providing you then replace it and providing the Local Rule, recommended by both the R&A and USGA, has been enacted. Discussion with a senior member of our club who’s is adamant on when a ball has been”addressed” a person is unable to change their choice of club, eg mistakingly taking a 6 iron instead of a PW (easily done). Could you please clarify as I can find nothing in the rules that indicate yes or no. Apologies for my delay in replying. I have only just received notice of your comment from Blogger. It's a myth and a new one to me! As you say there is nothing in the Rules that prevents a player from changing the club they have selected at any time before they make their stroke.